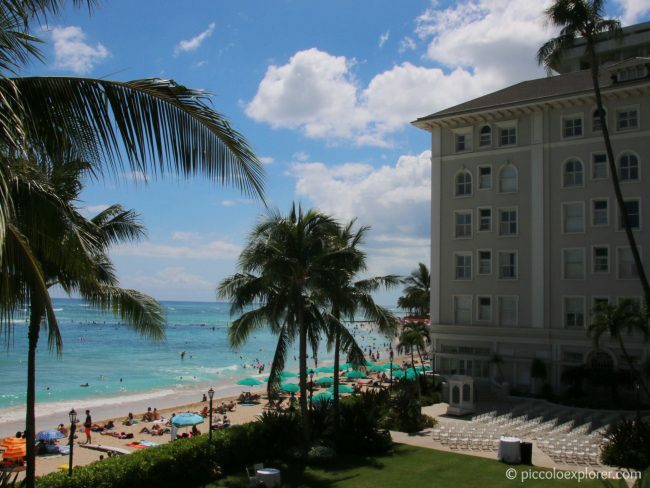 With its historic charm and excellent oceanfront location, the Moana Surfrider, a Westin Resort and Spa, is one of the most memorable places to stay on Waikiki Beach. 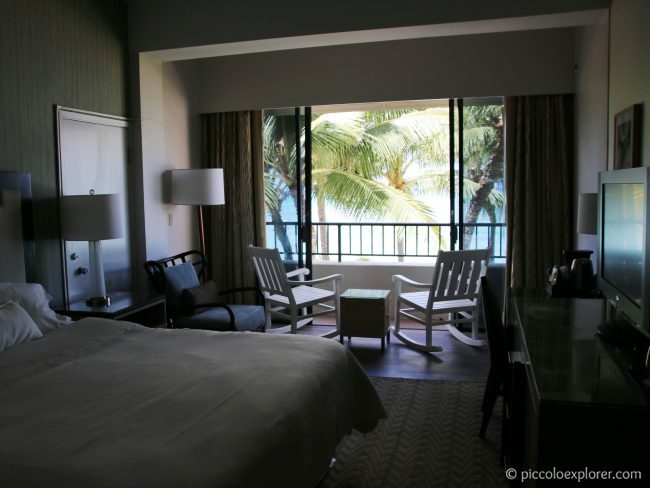 We’ve stayed there before years ago and when we chose to return to Oahu on our 10th wedding anniversary, we knew we wanted to be back at the Moana – this time for a family vacation with 22 month old Little T in July 2015. After researching various hotel booking websites, the best value I found at the time was by booking directly with the Starwood Preferred Guest team. It’s quick, free and easy to join SPG and often you receive benefits straight away. The SPG special promotion we received was a slightly reduced rate that included breakfast for two daily (kids under 5 eat free at the hotel) which was a great value over our 14 day stay. 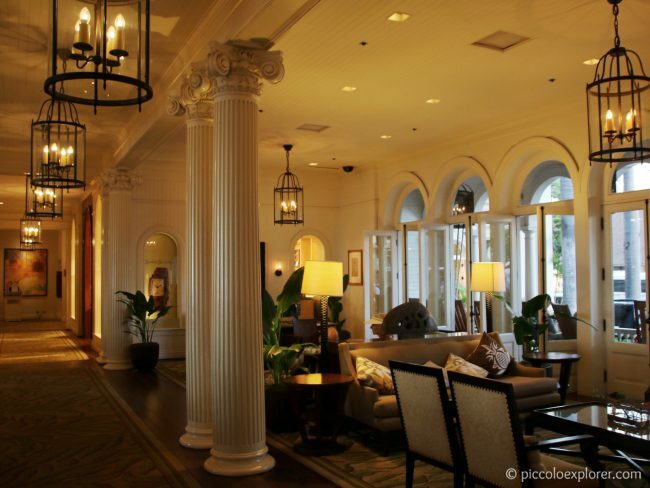 Built in 1901 as the first hotel in Waikiki, the plantation-style Moana Surfider is listed in the National Register of Historic Places and known as the First Lady of Waikiki. The Moana has kept its historic charm through the years, while undergoing renovation, expansion and restoration projects to maintain its reputation as a world-class, luxury destination. 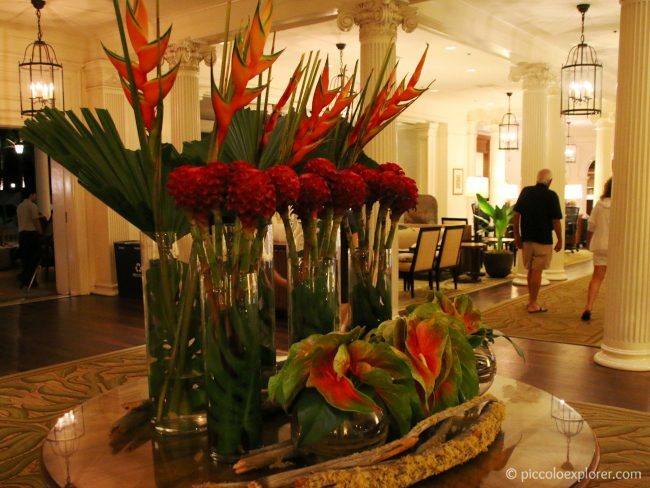 The lobby is a beautiful place to relax, with wide open doors overlooking Kalakaua Avenue on one side, and the courtyard through to the ocean on the other. One of my favorite areas at the hotel is the front porch with the row of rocking chairs – unusually quiet when I took this photo at about 8am. 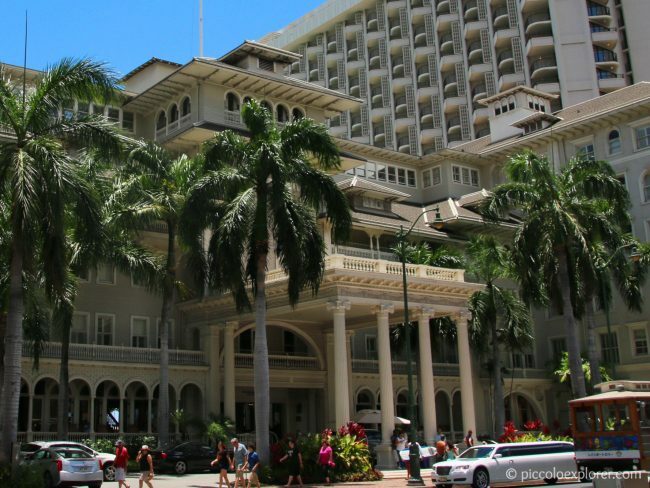 There are three buildings at the Moana Surfrider: the original Historic Banyan wing with the banyan tree in the center, the Tower wing (tall, contemporary building, shown below on left) and the Diamond wing (8-storey building on other side of the Banyan wing). Within each building, there are options for city or ocean views. We booked a Diamond Ocean Front room, which is that same type of room we stayed in last time. 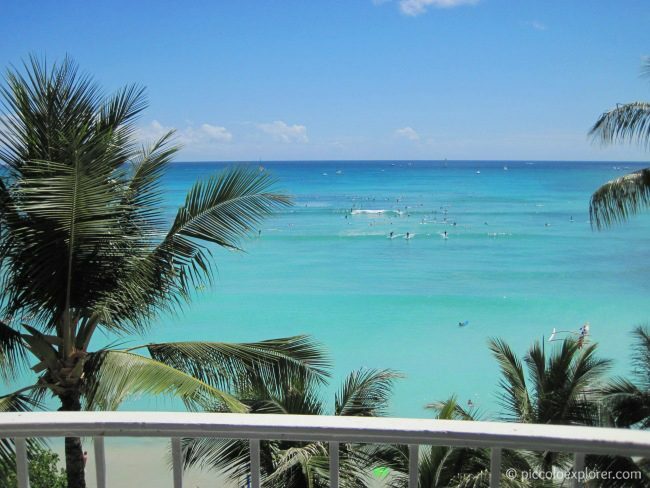 The Diamond rooms have been renovated in recent years (while I’ve read reviews that the Banyan rooms are rather dated), have the very comfortable Westin Heavenly beds and gorgeous panoramic views of Waikiki beach and even, from some rooms on the upper levels, Diamond Head. At about 29 sq m / 313 sq ft, the Diamond Ocean Front rooms are not large. 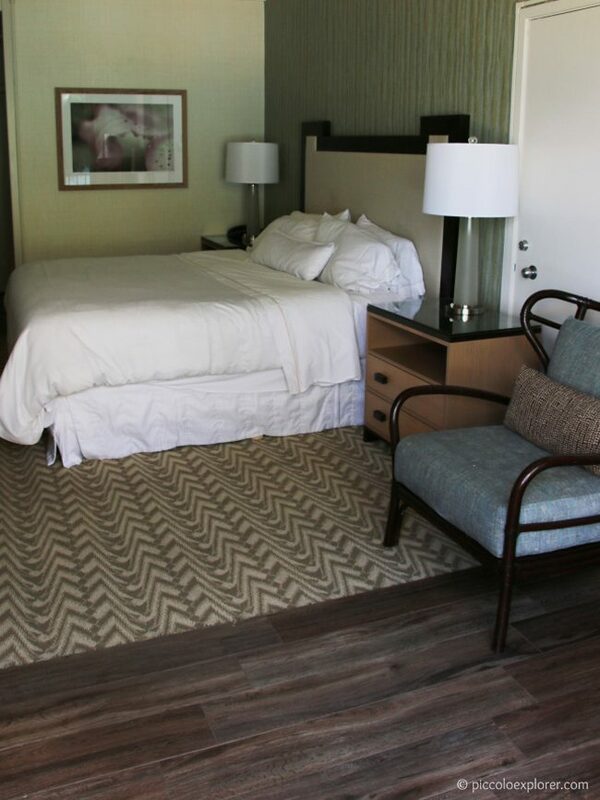 There is space for a cot or folding guest bed, so the room could fit a family with a baby or toddler but families with older children may prefer a connecting room or a more spacious room or suite with some privacy. 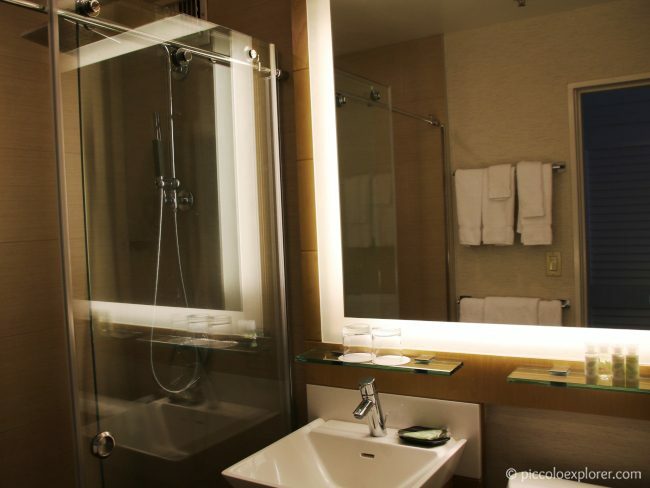 Each room has an LCD TV, complimentary Royal Kona coffee and select Tazo teas, a refrigerator and a granite bathroom with shower. During our first stay at the Moana, our room was on the 7th floor and the views were amazing looking out over the ocean and as far as Diamond Head. We didn’t feel comfortable staying so high up with a toddler and chose the 2nd floor the second time around. While the trees blocked part of the view towards Diamond Head, we felt close to the beach and at nighttime could hear the waves lapping against the shore. Little T preferred splashing around at the pool over the ocean and although the pool is pretty small and no-frills compared to other hotel pools in the area, we enjoyed spending many mornings there. The lounge chairs around the pool – especially the ones in the shade – are difficult to get! You either need to arrive very early or keep a close eye and pounce the moment someone leaves. The Moana has a 24-hour Fitness Studio offering state-of-the-art equipment in the Tower Wing, along with daily fitness classes. We didn’t manage it this time but had an outstanding experience at the Moana Lani Spa during our first visit. We both booked massages and enjoyed some time relaxing in their oceanfront lounge sipping tea. They offer a wide range of treatments that includes deep tissue massages, facial and body treatments, manicures and pedicures and aromatherapy. Having free breakfast at the buffet was an outstanding value. We started each day at the Veranda at the Beachhouse, where we first ordered pancakes then loaded up our plates at the buffet. 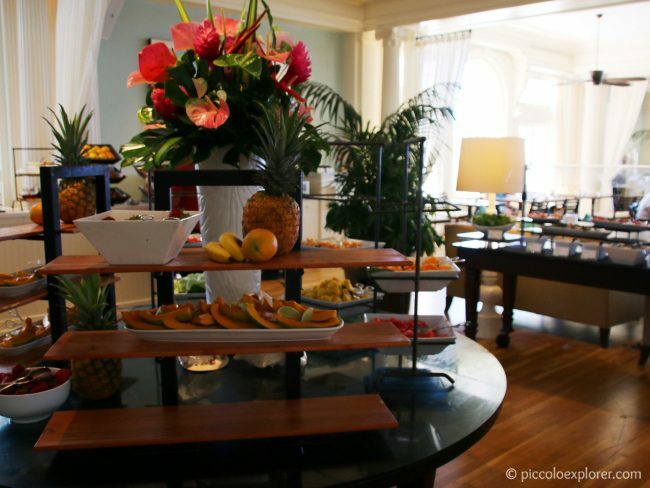 The buffet had a selection of fresh fruit, muffins and pastries, cold cuts and salads, cereals and granola. 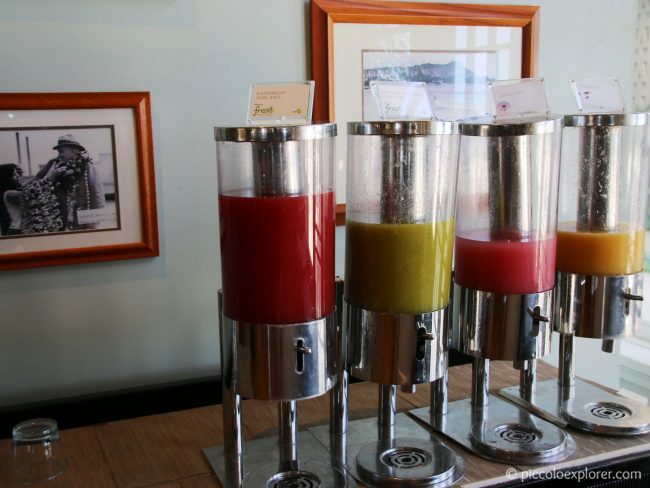 I loved the fresh fruit juices, often there was a new blend to try. On this day, there were watermelon basil; pineapple, mint and cucumber; guava and orange juices. There were several options at the hot food section that included scrambled eggs, chicken sausages, bacon, salmon, hash browns or (my favorite) mixed roasted potatoes. There was also a section with traditional Japanese breakfast items, including miso soup, tofu and steamed rice. 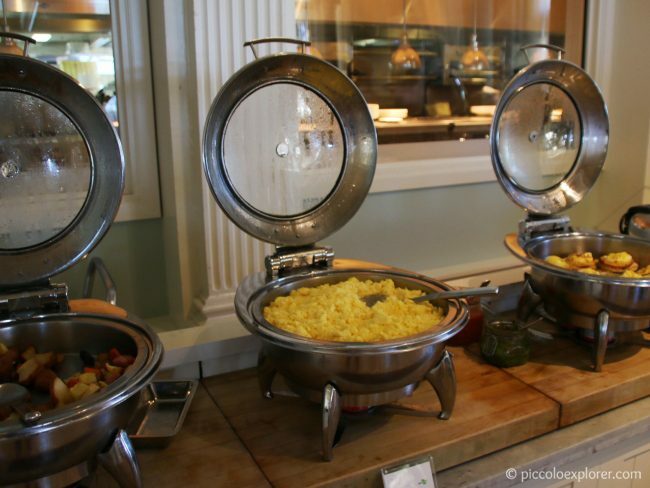 We loved having breakfast at the Veranda, and the customer service there was the best we had at the hotel. They were always so friendly and accommodating especially with Little T. There was plenty of selection at the buffet, that also changed slightly from day to day, so it wasn’t ever boring going there every day for two weeks. Little T loved the pancakes, sausages and fresh fruit. The restaurant is popular especially over the weekend with outside visitors coming for brunch – and from what I remember they operate on a first come, first serve basis – so the wait to be seated can be 30 minutes or more. 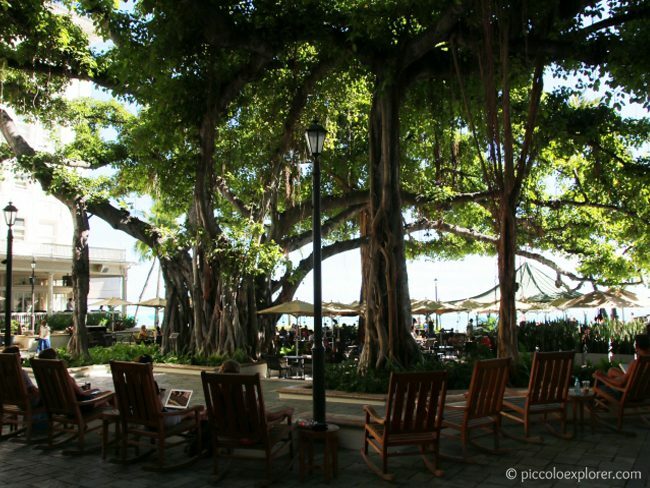 The hotel lobby opens up to the Banyan Courtyard and its historic sweeping banyan tree, which was planted in 1904 and now stands 75 feet high and spans 150 feet. The oceanfront Beach Bar (where the umbrellas are in the above photo) was one of our favorite places at the hotel to sit back and relax. We’d often go for lunchtime right after the pool or for drinks in the evening before dinner. There are live performances every evening at the Beach Bar, featuring local musicians and hula dancers. Although we’d walk through the veranda every day, we didn’t realize until the last days of our trip that the section across from the restaurant was a wine bar in the evenings (5pm to 10pm). Vintage 1901 overlooks the Banyan Courtyard and offers a wide selection of wines and artisan beers – I wish we discovered it earlier! 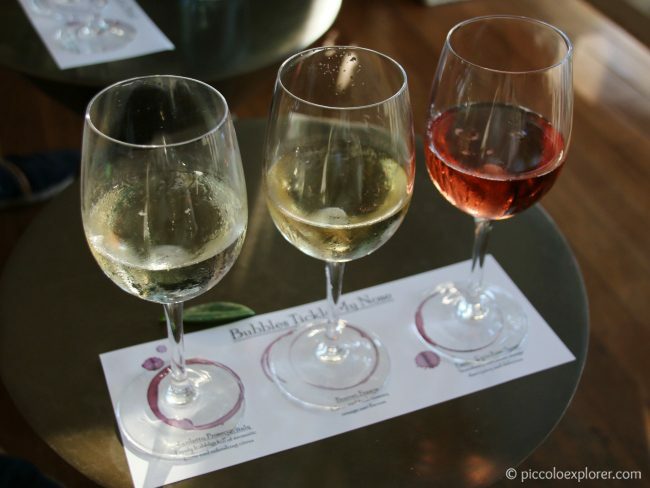 Other wine tasting selections, with prices ranging from $14 to $18, included wines by country, such as Italy, or by region – Argentina and Chile, New Zealand and Australia. The small bites menu was great, too – we ordered the steak sliders and truffle potato tots which were delicious. In addition, there’s a dessert menu with various cakes (including Kona Coffee cheesecake), sorbet, cheese and fresh fruit, making Vintage 1901 a lovely post-dinner stop as well. 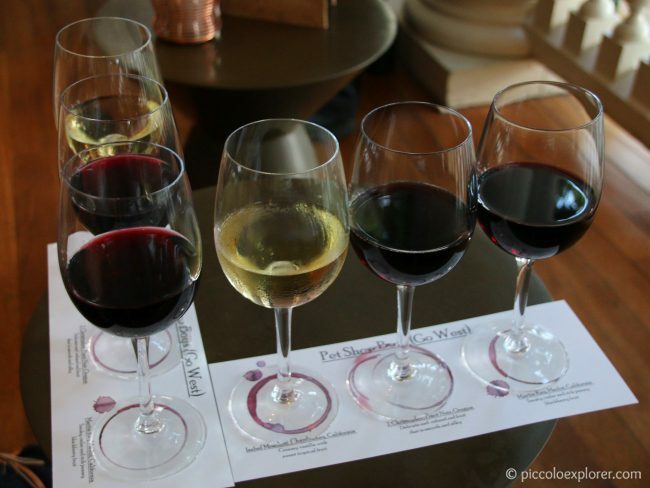 Although both times we visited the service was painfully slow, overall we really liked the selection of wine and food at Vintage 1901 and would go back next time we’re in Waikiki. 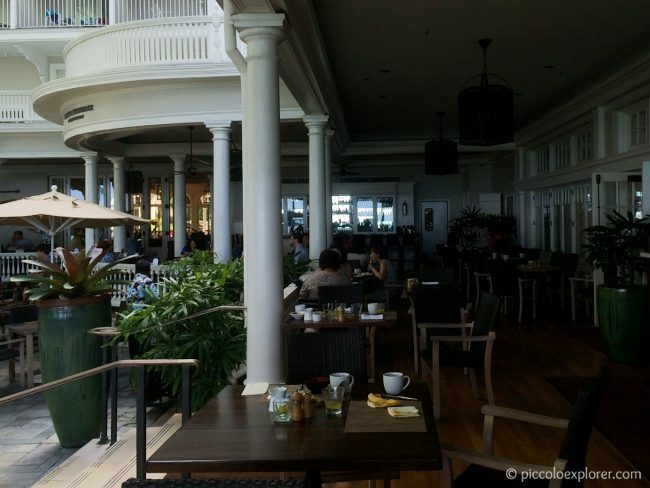 For dinnertime, the veranda area is the location for the hotel’s fine dining restaurant, the Beachhouse at the Moana. 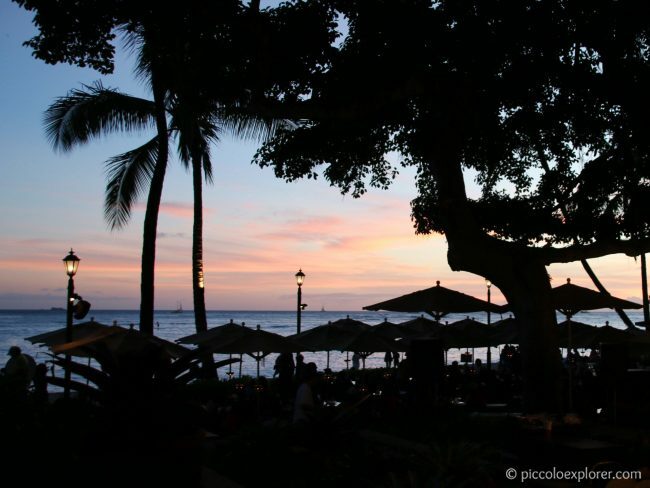 The best tables are right at the end of the veranda overlooking Waikiki beach. We were a few tables away from the edge but it’s still a stunning view especially at sunset – shown below is the Beach Bar with the historic banyan tree. 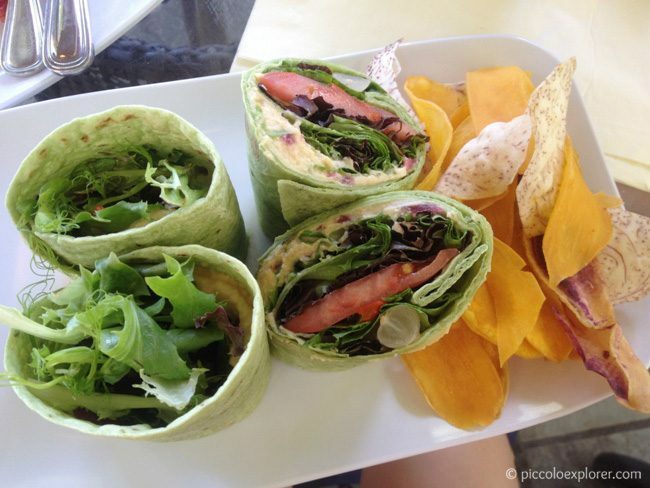 Some of the best dishes we had during our visit to Waikiki were at the Beachhouse. Mr. G raved about the seafood dishes, such as the Hawaiian “Poke” starter, which was ahi tuna served with soy sauce, onion, avocado crema and spicy aioli and his entree (below), the porcini crusted ahi loin with warm barley salad and a chili vinaigrette. I had the braised short rib served with gruyere polenta and wasabi pea gremolata. The meat was very tender and the whole dish was delicious and bursting with flavor. 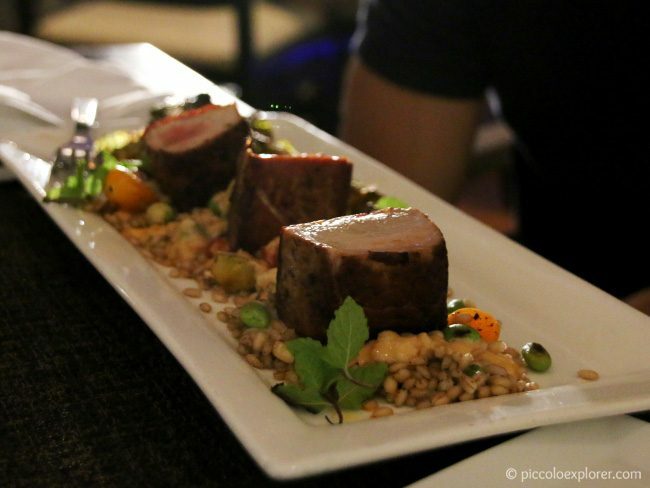 I’ve shared a few more photos of our dinners at the Beachhouse in the Eating Out in Waikiki post. This restaurant books out quickly so make sure to put in your reservation well ahead of time. We enjoyed both of our experiences at the restaurant and would highly recommend it for an excellent dinner out in Waikiki. 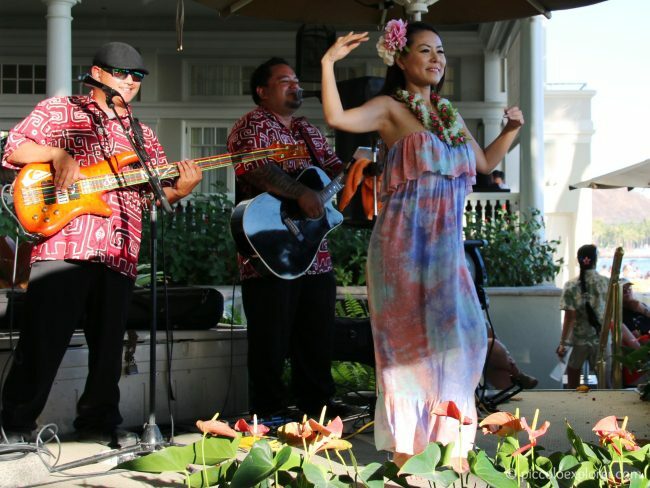 The Moana Surfrider regularly hosts special events and performances, usually on Friday evenings or over the weekend. 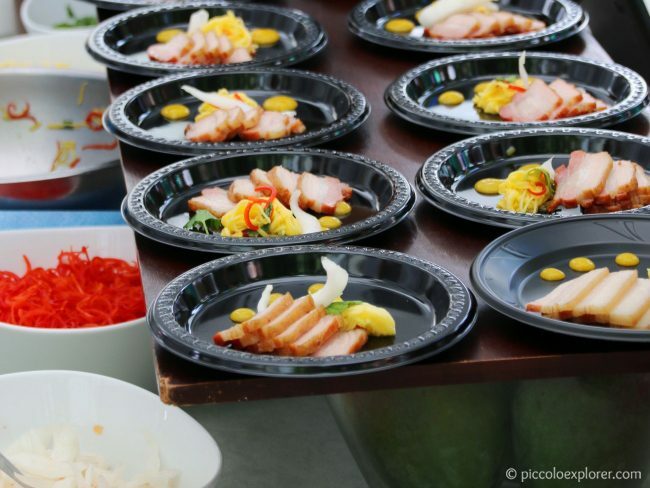 The first Saturday we were there was the annual Mangoes at the Moana event, where mango producers showcase the tropical fruit in food demonstrations and workshops and local celebrity chefs create delicious mango recipes that visitors can sample (with ticket purchase or by plate). 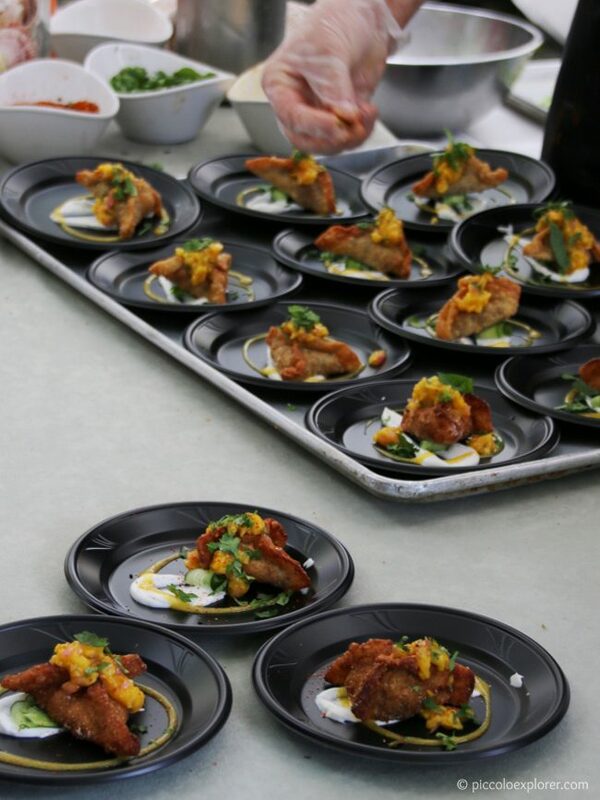 I went back for seconds of the lamb and mango dumpling by Chef Lee Anne Wong of Koko Head Cafe – delicious! 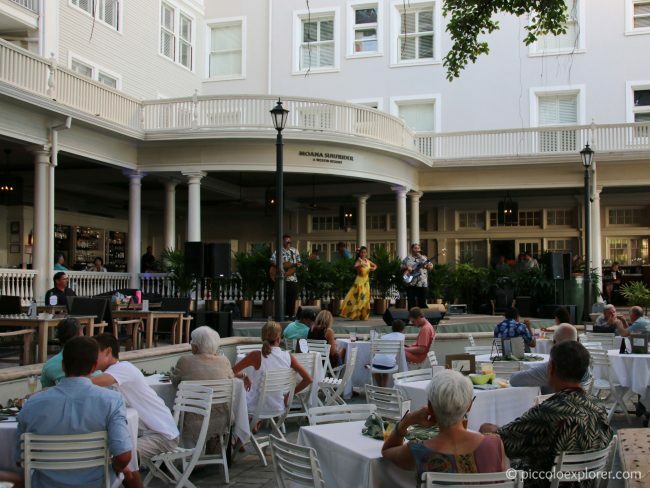 The Moana Surfrider also regularly hosts music performances by local artists – and on our last evening, we had dinner at the Beachhouse listening to the beautiful voice of award-winning Hawaiian musical artist, Raiatea Helm, performing in the courtyard. I didn’t manage to take a photo – the hula performance below was right before Raiatea Helm took the stage. The most treasured souvenir from our trip was a 30 minute photography session with one of the hotel’s professional photographers. I’m usually the one behind the camera, so it was particularly special to have 400+ photos of the three of us, with beautiful Waikiki Beach or the Moana as a backdrop. What I would do differently is choosing only one or two locations for the photo-shoot. We had photos taken at the beach, in the courtyard, in front of the hotel, in the lobby and on the front patio rocking chairs – and it does take extra time to settle in with a toddler each time. 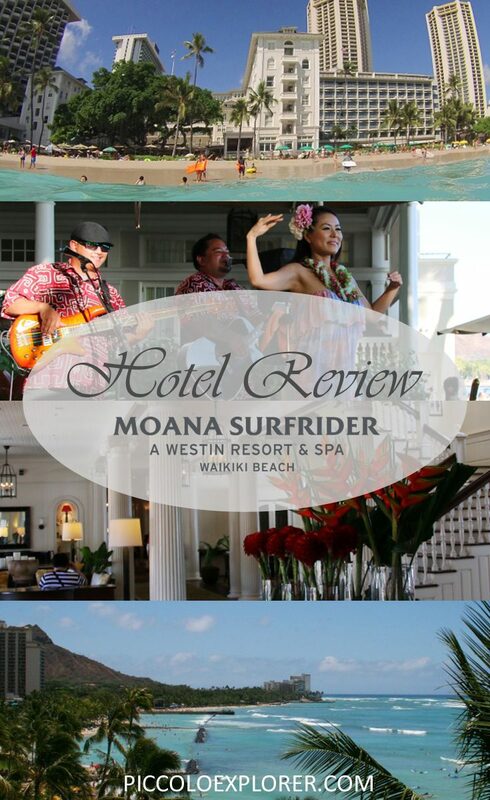 Staying at the Moana Surfrider has always been a memorable experience for us – the ocean views are incredible, the restaurant and bars are fantastic overlooking the beach and the hotel itself is beautiful. Families with young children staying for over a week, however, might prefer a resort that offers a kid’s club with activities or a swimming pool more suited to young kids. 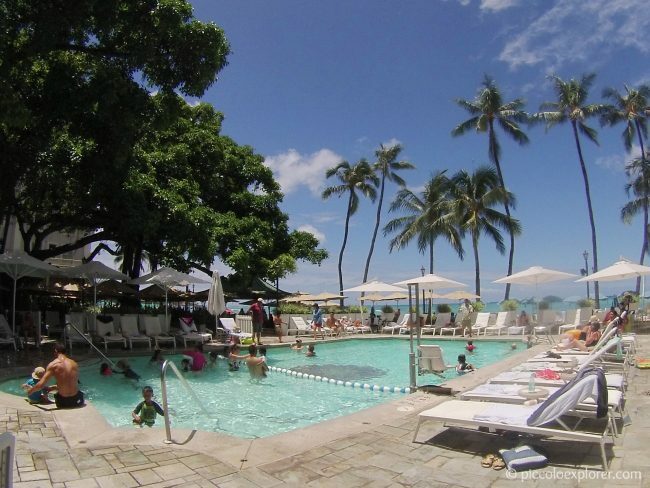 During our two week stay, we did miss having those types of facilities, so on our next visit to Oahu (until our children are older) we’d most likely stay at a resort with more family-friendly facilities. 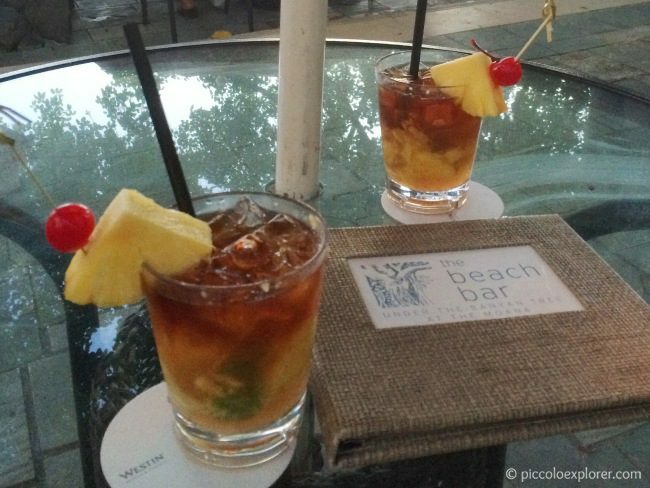 That said, for a shorter stay in Waikiki, we’d choose the Moana and would always still make a stop to sip a mai-tai at the Beach Bar or enjoy dinner at the Beachhouse! 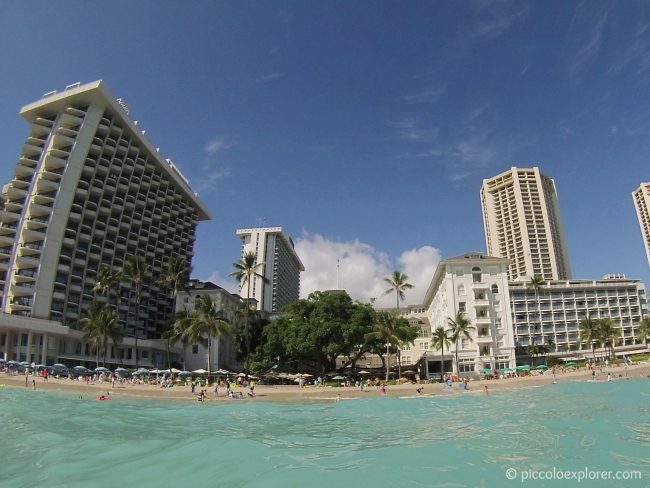 I’ve listed tips in the Visiting Waikiki with a Toddler post that include nearby shops to purchase groceries, essentials, beach gear and souvenirs. The hotel does not have a creche or kid’s club on-site but recommends the Poppins Keiki Hawaii Daycare at its sister hotel, Sheraton Waikiki (about a 15 minute walk away). Little T enjoyed playing at the kid’s club for two afternoons – the staff were very professional and kind. I’ve stayed here twice and loved it! 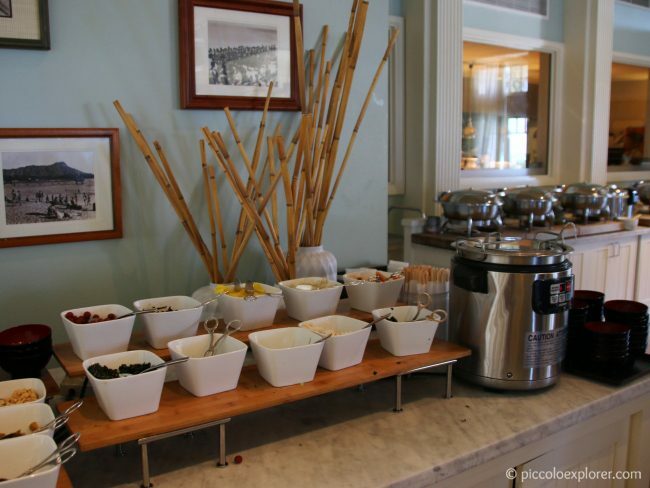 You’re right, the breakfast buffet is really one of the highlights. The Moana truly is luxurious. 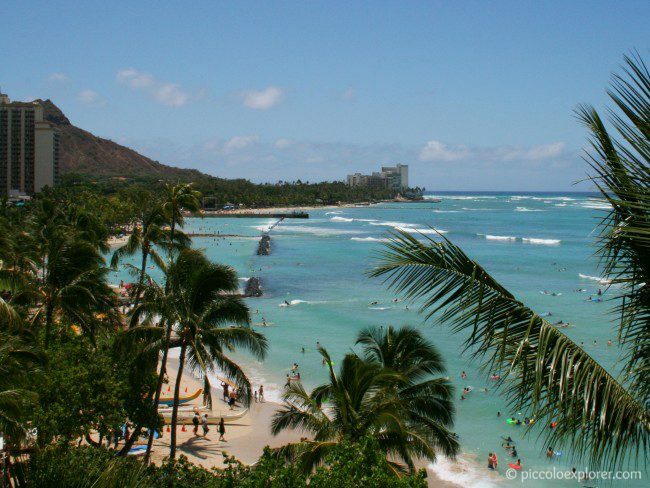 I would recommend it to anyone planning to stay in waikiki! We love it there at the Moana! It was our top choice for our anniversary – such a wonderful place and so much I miss about that place! Love Hawaii too! Can’t wait to go back and I’d love to see more of the islands. 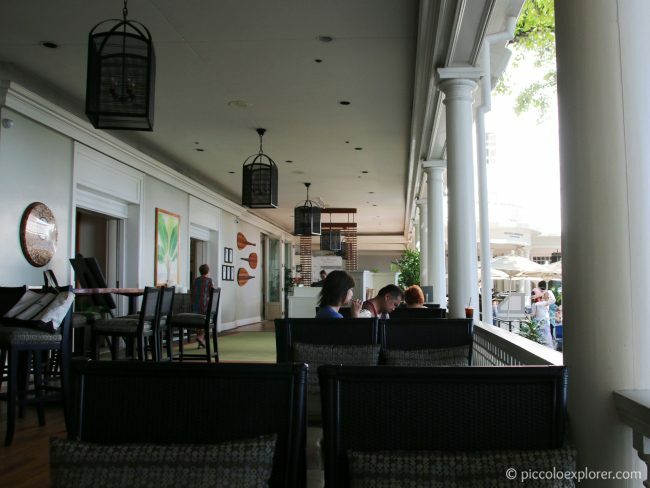 The Moana is a fantastic place to stay in Waikiki and the banyan courtyard was a great place to sit back and relax. Those dumplings were delicious! Breakfasts have become one of my favourite meals at hotels too with Little T and it was great having the buffet included in the room rate. It’s something I try to look for when booking a hotel as it is so convenient. Great review! How did you book the photographer? Thank you! We booked the photographer in the hotel lobby. There’s a stand for the photographers near reception where you can see examples of their work and book an appointment. My favorite resort on Oahu. The staff at the hotel and especially the restaurant were very welcoming and helpful. So genuine. 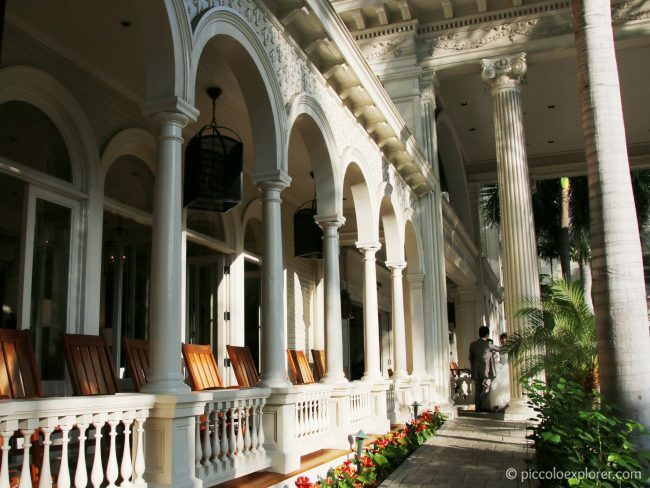 The Veranda is like Old Hawaii.